CARBONDALE, Ill. -- Despite news stories of kidnappings, assassinations, military battles and anti-American protests, two Southern Illinois University Carbondale agriculture professors who visited Afghanistan last month say they never feared for their safety. "That was more a concern of my wife and the people back here," said Phillip R. Eberle, associate professor of agribusiness economics in SIUC's College of Agricultural Sciences, who spent a week at Balkh University in the northern city of Mazar-e-Sharif. "About a day before we returned to Kabul, there was a bombing that killed three people at an Internet café. When my wife heard about that, she expressed some concern. "But we were in a more secure area. We saw only two or three armored vehicles in Mazar — I don't recall even seeing a policeman with a gun. The transportation system was more of a concern. I don't see how they avoid being in car accidents!" Agronomist Oval Myers said he never worried about becoming a target of anti-American sentiment while in Afghanistan. "I pretty much blend in," he said, showing a picture of himself in the country's native garb. "I even had some people ask me for something not realizing I couldn't speak their language. In native costume, you can't tell — until I open my mouth! "But I don't look for trouble, and I don't go to places where I'm likely to stand out. I don't think I'd want to be there driving around in a car with ‘UN' or ‘CARE' on it — something that identified me as a foreigner." 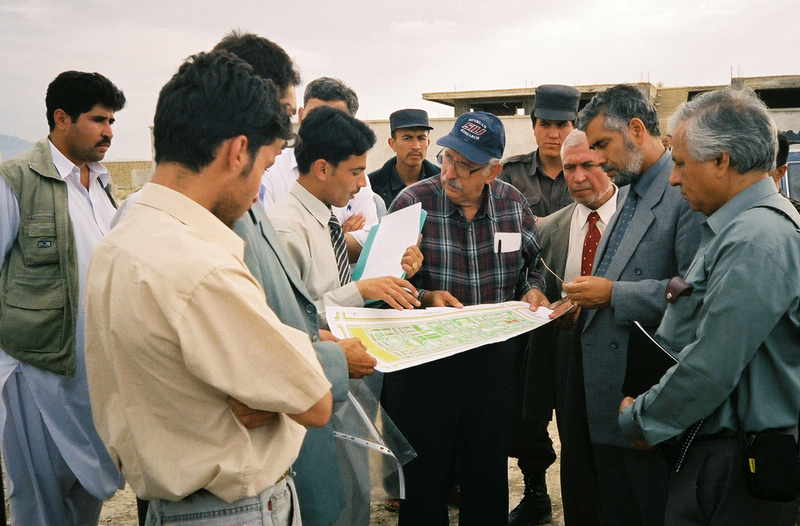 Eberle and Myers went to Mazar as part of a joint effort with the University of Illinois at Urbana-Champaign and Northwest Frontier Agricultural University in Peshawar, Pakistan, aimed at rebuilding Balkh University's agriculture programs. Money for the $120,000 project, which includes updating classroom, field and laboratory offerings, skills and materials, comes from the U.S. Agency for International Development through the Association Liaison Office for University Cooperation in Development. The two SIUC professors served as advance men of a sort, scouting out what was needed and what they had to work with. Later teams will offer general training in course design, teaching methods and evaluation techniques with specific seminars tailored to faculty teaching in the university's three agriculture departments: plant science, animal science and forestry/horticulture. Balkh's agriculture dean and his department chairs also will visit Malakander Farm in Pakistan to see firsthand how to run a successful teaching/research farm. Eberle and Myers found challenges aplenty in their week at Balkh. Of the 15 faculty members, only four have master's degrees; those with bachelor's degrees received their training mostly from faculty who themselves had only bachelor's degrees. Just a few of the Balkh professors have even "a smattering" of English. "One of our roles is to improve their grant-writing ability so they can move beyond this project," Myers said. "We've identified learning English as one of their needs, so one of the people on the project team specializes in teaching English as a second language." All three departments badly need teaching materials and equipment. "Right now, their method of instruction is a blackboard and one set of notes that the teacher passes out," Eberle said. Myers added, "Their library holdings are in two modest-sized bookcases, and much of that material is old. They have three overhead projectors (two that work) and two computers — one laptop (though the university currently doesn't have Internet access) and one so out of date that it can only do word processing. They purchase some things out of pocket, but they don't make that much." Lack of space — a chronic complaint in American universities — pinches particularly hard at Balkh. "Space is so limited they're teaching in the hallways," Eberle said. "The classrooms are on a rotation basis — the agriculture faculty get the morning. They have two lecture halls, one small classroom and a lab that they're using for storage." Then there are the electrical outages and water problems. "It's a typical development situation, but the people we worked with were friendly and, for the most part, forward thinking — they just don't know where they're trying to go, and they have trouble seeing what they have." Myers said. What they have, he noted, is a location in one of their country's most fertile regions. They have a student body that has grown from the seven enrolled after the collapse of the Taliban regime to roughly 300 now. And they have the only agriculture-related university courses in their region. "When we go there, we see opportunities," he said. Serving others is among the goals of Southern at 150: Building Excellence Through Commitment, the blueprint for the development of the University by the time it celebrates its 150th anniversary in 2019.